The TASE500 offers a highly effective, SWaP (Size, Weight and Power) – C (Cost) optimized reconnaissance system for the manned helicopter market. 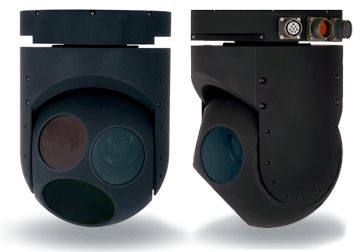 Built upon the legacy of the TASE400, with over 150,000 hours of successful mission operations just in the last 3 years, the TASE500 more than doubles the range, increases stabilization and provides an all digital , all HD multi-camera solution with continuous zoom HD EO, MWIR and SWIR. The Viewpoint (VP) software interface provides command control and autonomous mission planning capability in addition to video and data viewing and analysis for the mission operator. Standard H.264 data output can easily be retransmitted to remote operators at distant locations. Supporting CoT (Cursor on Target) and demonstrated high accuracy TLE, the TASE500 provides you, the customer, with a complete tactical military ISR solution for low-medium tactical miltary and law enforcement missions. The TASE500 provides an ideal SWaP optimized solution for a variety of military ISR mission needs such as combat search and rescue (CSAR), medical evacuation (MEDEVAC), insertion/extraction during combat missions or combined with other airborne assets in support of targeting and combat roles. The TASE500 camera (shown here mounted on a Sikorsky UH-60 and Bell OH-58 helicopters) includes continuous zoom HD-EO for high resolution day-time target differentiation identification and recognition and continuous zoom HD Mid Wave Infrared (MWIR) to provide high resolution thermal imagery for detection, recognition and identification day or night, and Short Wave Infrared images (SWIR) to see through smoke, maritime haze and atmospheric obscurants. All HD digital, multi-camera solution makes the TASE500 a high performing lower cost alternative ideally suited for MEDIVAC and CSAR missions. Our airborne ISR solutions bring our customers all they need to get the job done effectively, at a price that makes sense in tight-budget times. By utilizing technology into a small, lightweight imaging payload, we can provide the same or better video quality as other providers, with a much smaller impact on aircraft endurance, and a much smaller impact on the budget.